I guess that isn’t so surprising. Trump always has viewed the bilateral balance as a critical indicator—and, well, China has long been willing to commit to buy more U.S. goods. Big purchases are an easy way to generate something to boast about—a tweetable deliverable. No doubt there will be other, more “structural” components to help dress up the purchase commitment. China has agreed to something on currency: perhaps a commitment to avoid competitive devaluation (an existing G-20 commitment by the way), perhaps something more. China has signaled it is willing to let foreign firms take majority stakes in a few more sectors, and has reiterated its belief that technology transfer isn’t a legal requirement for entry into the Chinese market. There are likely to be settlements on some long-standing disputes as well—the rating agencies have gotten approval to enter the Chinese market; Visa, American Express and Mastercard likely will finally get approval too (Mastercard through a joint venture… not everything changes); and some tariffs introduced as retaliation in the past may get dropped. Perhaps there will be deals on Huawei and Micron too—China no doubt wants the United States to forgive Huawei for its Iran sanctions transgressions, the United States wants China to drop its retaliation against Micron (China is blocking Micron’s chips after the United States accused Fujian Jinhua of intellectual property theft, e.g. trying to steal Micron’s DRAM designs). As important as what is in the deal will be what isn’t in the deal. There doesn’t seem to be anything limiting China’s subsidies to its civil aviation industry, or towards its semiconductor industry. I haven’t seen any real signs that China is willing to scrap its local content requirements for medical equipment, or for many other sectors. China 2025 will get rebranded, but, best I can tell the policies behind it won’t go away. Any deal will have a big headline number ($1.2 trillion?). But the headline number needs to be taken with a grain of salt. To move the needle, China needs to commit to buy more than it otherwise would…and that means evaluating its commitment relative to some kind of baseline. 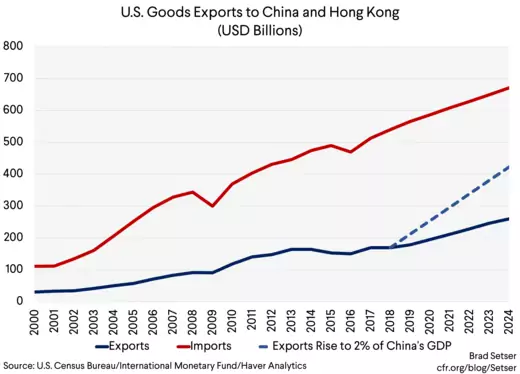 To keep it simple, I would start by assuming that U.S. exports to China will grow with China’s economy, and China’s exports to the United States will grow with the U.S. economy. This simple forecast has a bit of technical merit—there aren’t large inflation differences right now, the currency is supposed to stay stable, and trade generally is growing along with the global economy these days. 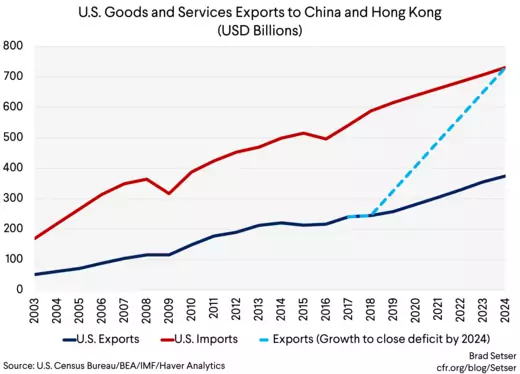 To make the U.S. data better match the Chinese data*, I added U.S. exports (of goods) to Hong Kong to U.S. exports to China—and to avoid controversy I used the IMF’s forecast for U.S. and Chinese growth as a baseline. The IMF’s baseline for China's future growth seems a tad optimistic to me, but I didn’t fiddle with it. Under these assumptions, U.S. exports to China should grow substantially over the next several years. If U.S. exports stay constant as a share of China’s GDP, they would rise from a pre-tariff peak of around $170 billion to around $260 billion (a cumulative six year rise of $300 billion, which sounds big—but still a sum that is a long way from $1.2 trillion). But U.S. imports would rise from $540 billion to $670 billion or so, and the bilateral deficit would increase a bit. Consequently, a commitment to bring the bilateral deficit down implies something more than business as usual. That’s particularly the case because the standard assumption that China’s imports (and thus U.S. exports) would grow in line with China’s GDP hasn’t actually held over the last ten or so years. U.S. exports have lagged China’s GDP growth. But some of the commitments that have been talked about—like getting rid of the bilateral deficit—are clearly unrealistic. To bring the bilateral goods deficit down to zero, U.S. goods exports would need to grow from $170 billion to somewhere north of $600 billion: a lot of export categories need to more than triple over six years (e.g. the 2024 level would need to be 4 times current exports). There are sectors where U.S. exports could grow rapidly. Energy for example. Exports went from next to nothing to close to $10 billion in 2017, and were poised to rise more before the tariffs. Peak monthly exports were getting close to a $20 billion a year annual pace. But even if U.S. exports of oil and gas go from $10 billion to $100 billion over six years ($100 billion is something like 5 mbd of oil and gas equivalent, at a price of between $50 and $60), the United States still needs to find another $300 billion in extra exports to get close. The big bucks, incidentally, are still in oil— not in LNG. China currently imports something like $40 billion in gas, and more like $250 billion in oil. Agriculture also has some potential. China has offered to raise its imports by $30 billion. The scope for explosive growth in soybeans is actually fairly limited, as the pre-tariff base for soybeans was quite high—the United States was supplying $12 billion of China’s almost $40 billion in oil seed imports. A huge tilt away from Brazil might cause U.S. beans exports to double, but getting much more than that would be difficult (there is a natural seasonality to soybean trade that favors alternating supply from the Southern and Northern Hemispheres). The real growth would need to come in sectors where China doesn’t buy much now. Corn. Rice. Perhaps pork and beef. Right now China imports about $5 billion in grain from the world (not much, as trade in grain is highly regulated) and $10 billion in meat. It isn't hard to see how those numbers could increase substantially. Getting really big numbers there though would risk pushing up U.S. prices, and getting China to abandon its goal of self sufficiency in basic grains. China also supposedly wants to buy more U.S. semiconductors. OK—not really; China’s top goal is to reduce its reliance on imported semiconductors, not to import more. Its goal is self-reliance. But it wants to get credit for imports of ‘chips that now go from the United States to Mexico or Malaysia before being sent to China for final assembly. It isn’t clear though that this is a good deal for the United States—China views Chinese assembly and testing as part of a broader strategy to strengthen its ability to manufacture more of the chips its huge electronics sector needs. The real problem though is that China—judging from the original local content goals in China 2025—doesn’t want to import a lot of other products. Most of the big manufacturing categories (autos, aircraft, semiconductors — in electronics, and the like) aren't likely to grow substantially. Take aircraft, an enormous U.S. export. The C919 necessarily will substitute for either future purchases of A320s or 737s. China also wants Airbus to build its widebodies in China, and it is is trying to reduce its imports of aircraft engines as well—COMAC is reportedly negotiating with Rolls Royce to get Rolls Royce to set up a factory inside China to get an order for China’s future widebody. Think about the Chinese market for top-of-the line CAT scanners and other medical equipment. According to Tom Hancock of the Finacial Times: "Beijing wants to increase the use of domestically produced devices in hospitals to 50 percent by 2020, and 70 percent by 2025, as it seeks to create “national champions” that can conquer export markets." China’s goal to produce almost all of its own agricultural machinery cuts into another potential U.S. export. What about cars? Gasoline powered autos aren’t one of the priorities of Made in China 2025—and China is supposedly prepared to cut its auto tariff further. The problem: China already makes way more cars than it needs—with the current level of overcapacity, it isn’t obvious why Chinese imports of cars will grow. In fact, U.S. exports of autos are likely to fall as Tesla opens its factory in Shanghai and BMW starts building more SUVs in China (to start exporting from China) now that it has raised its stake in its Chinese JV to 75 percent (getting approval required commitments to increase domestic Chinese production; for confirmation just read BMW’s press releases.) The JV requirement acted as a tax on producing high-margin luxury cars in China, as profits had to be split with the JV partner: without that tax, some firms will have a stronger incentive to produce in China even with somewhat lower tariffs. There are only so many places to look for big increases in U.S. exports. Even if China did its best to reduce the bilateral deficit by diverting Chinese demand for LNG away from Australia, Chinese demand for agricultural goods away from Brazil and Argentina, and Chinese demand for aircraft away from Europe, the numbers just don’t work. The only way to get close to the needed number would be if the Taiwanese and Korean semiconductor fabs picked up and moved to the United States—China does import a lot of integrated circuits, to its immense disappointment. 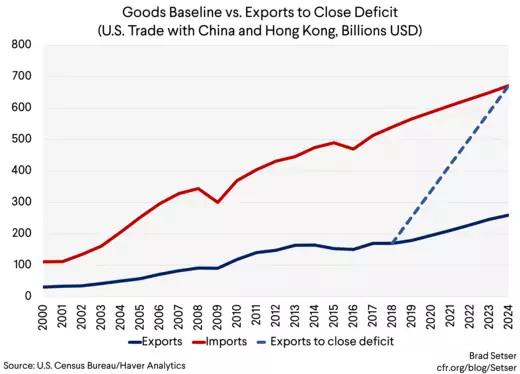 Botton line: the $80 billion a year increase in U.S. exports for six years needed to close the bilateral deficit just isn’t going to happen. What about adding in services? One of my more controversial opinions is that I actually don’t think it helps much. With services—think tourism and education—current U.S. exports to China and Hong Kong rise to around $225 billion while imports should approach $600 billion. ** But after accounting for expected growth in goods imports, closing the bilateral deficit would still require around $700 billion in exports in 2024. The bulk of current U.S. service exports are vacations (and college degrees)—services that require the physical movement of people. That could grow some. But to get a big jump you need other services exports to soar—and my best guess is that it will prove difficult to export most services from the United States to China—given linguistic, cultural, and legal barriers and, well, very different time zones. (To my surprise, Goldman seems to agree in its recent report on the topic). A lot of the trade discussion under the heading “trade in services” is actually about cross-border establishment*** and that’s FDI in my books—not trade. **** The big U.S. banks aren’t really looking to provide banking services from the United States to China—they are looking for the ability to set up shop in China and hire Chinese bankers to provide banking services in China. And if U.S. hospital groups set up in China, they will provide medical services in China by hiring Chinese doctors and nurses (and using Chinese made medical equipment if they want reimbursement from the government). At the end of the day, when you start doing the math, the only realistic path to reducing the bilateral deficit significantly—if that is indeed the goal—is to reduce U.S. imports from China. So then, is the right thing to do just to abandon Trump’s obsession with the bilateral deficit and go back to negotiating for “structural” shifts in China’s business environment? The problem with asking for structural changes is that narrow measures, changes in a specific Chinese law and the like, don’t have a history generating significant results. The United States negotiates for a change in one area, but then it turns out that there another ten things that need to change before a U.S. firm can really compete on a level playing field inside China. See Tom Mitchell of the Financial Times. The structural problem with China, in a sense, is that China’s state exercises a lot of influence over China’s economy. The two biggest U.S. exports to China have long been aircraft and soybeans. In both cases, who is actually doing the buying inside China? Well, China’s state. That’s obviously the case for aircraft, where the three main airlines are all state owned (and Hainan airlines, while technically private, is in no position to push back against pressure to say buy the C919). 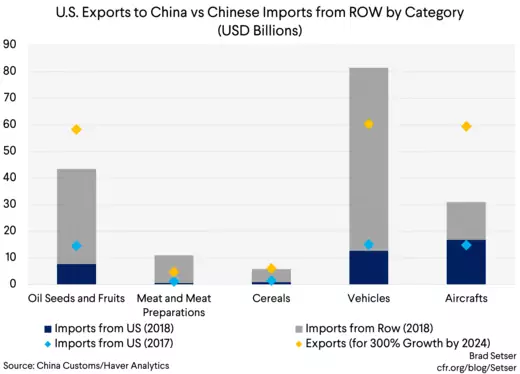 It is largely the case for soybeans, where China’s old state grain trading monopoly (COFCO, now a centrally owned SOE) still dominates the market and private imports require a state license. And it is likely to be the case if the United States exports more oil and gas since China’s government controls the oil and power sectors. 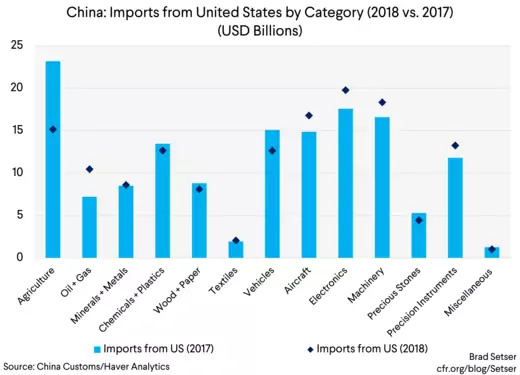 In a world where China's big state firms control the bulk of its imports of commodities and capital goods, I don’t think it is crazy for the United States to be asking for China’s state to set out targets for China’s imports as it undertakes structural reforms to open up. It would help counter all of the informal pressure to substitute Chinese production for imports intrinsic in the Chinese system. Germany's Mercator Institute wrote: "Chinese high-tech industries, in particular the national champions, are expected to acquire the capabilities to create independent innovative technological solutions and replace their foreign competitors on the domestic market and increasingly also on global markets." 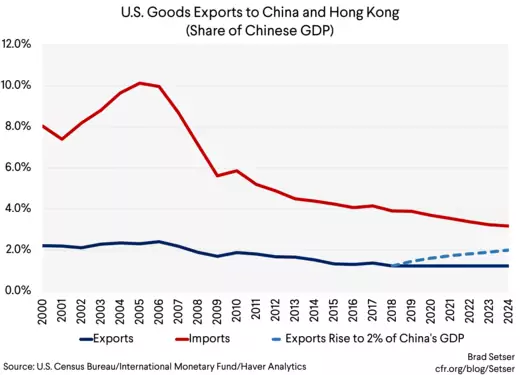 U.S. exports were about 2.3 percent of China’s GDP back in 2004, and they are only 1.3 percent of China’s GDP now; manufactured exporters were about 2 percent of GDP in 2004, and are well under 1 percent of China’s GDP (here is a graph illustrating this point). 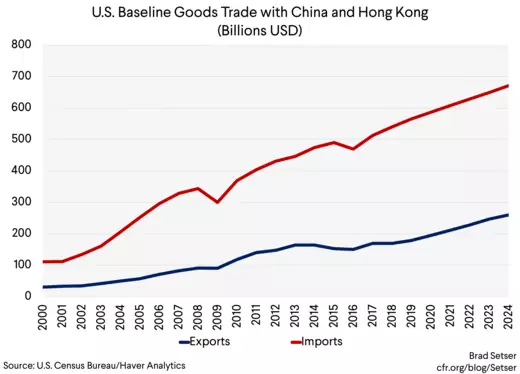 A commitment on China’s part to raise its imports of U.S. goods back to 2 percent of its GDP by say 2024 would be enough to more than double U.S. goods exports—from $170 billion now to over $400 billion in 2024. That kind of increase doesn't look unnatural when plotted as a share of China's GDP. The United States would be asking for a return to a pattern of the level of U.S. exports in the not-so-distant past, not a revolution. But if the United States is going down this road, I would add a twist. I would frame the goal as an increase in China’s imports of manufactures—as China’s imports of commodities will grow no matter what. 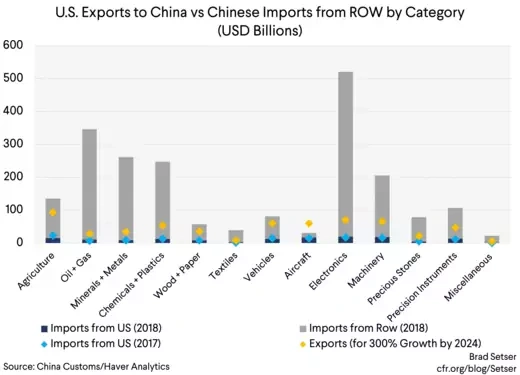 China’s imports of U.S. manufactures are now about 1 percent of its GDP, and its imports of manufactures from the world (net of parts imports) are under 5 percent of China’s GDP (somewhat less, as a share of China's GDP, than before it joined the WTO). There is scope for that to grow in a way that helps all of China’s trading partners. ** There is also a problem of measurement induced by the U.S. tax code—U.S. firms that could export services—licensing IPR is a service technically—to China often prefer to export from a tax haven so that the large profits typical of IPR sales are taxed at a lower rate. Apple exports a certain amount of U.S. software to China, but given its tax structure, it basically first sells the IP to its Irish sub, and the big trade numbers end up showing up there. *** The OECD’s measure of restrictions on trade in services is actually a bit misleading—a lot of the restrictions are actually restrictions on cross-border investment, and others have the character of a regulatory difference rather than a barrier at the border. **** Cross border investment generates profits that count in the income balance. They are generally a modest fraction of total domestic sales. Right now U.S. firms earns something like $20 billion on $250 billion in sales inside China (according to the IRS data on the geographic incidence of U.S. firms profits in 2016). ***** For more, see my testimony before the Senate Small Business Committee.